A guy walks into a bar in Decatur and orders a lite beer. It sounds like a bad joke, but the funny thing is that it happens right next to us at The Brick Store, which has the longest and best beer list in the city. The bartender does not laugh, and is nice and suggests something from the menu that is light-colored, but is not a lite beer. The best bar in Atlanta is in…Decatur. Date Night returns to Decatur, where it’s hip to be square. (Extra points to our readers who get the Huey Lewis reference.) We are on the square at The Brick Store, a place we never miss when we visit Decatur. We have had beers here many times, but we have never eaten at this gastro-pub. If their food is anything like their beer menu, we are in for a treat. We arrive around 6PM and the place is packed. We are told there is a 30-minute wait for a table, so we head upstairs to the Belgian beer bar to pass the time with a really good beer. A few minutes after we ascend the stairs, two seats open up for us at the bar, which we quickly snap up. No more wait for a table as we can eat at the bar. The beer menu reads like a book, probably because it is a book. 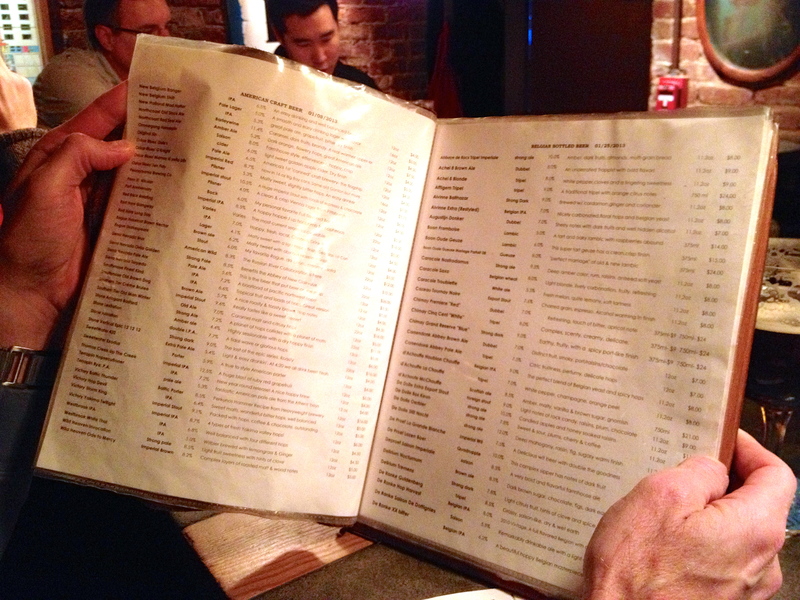 The beer menu has seven pages of beers with at least 30 beers on each page. How can we possibly decide on something to order? Luckily, we are sitting right in front of the taps, which feature eight Belgian beers tonight. This narrows our choice down to eight and we pick two incredible brews. Our search for the best beer in the world may have just ended here. These are malty, high-alcohol beers (9% ABV) with hints of caramel, fruit and chocolate. The Abbaye de Rocs (the one on the right) tastes a lot like a Tootsie Roll. 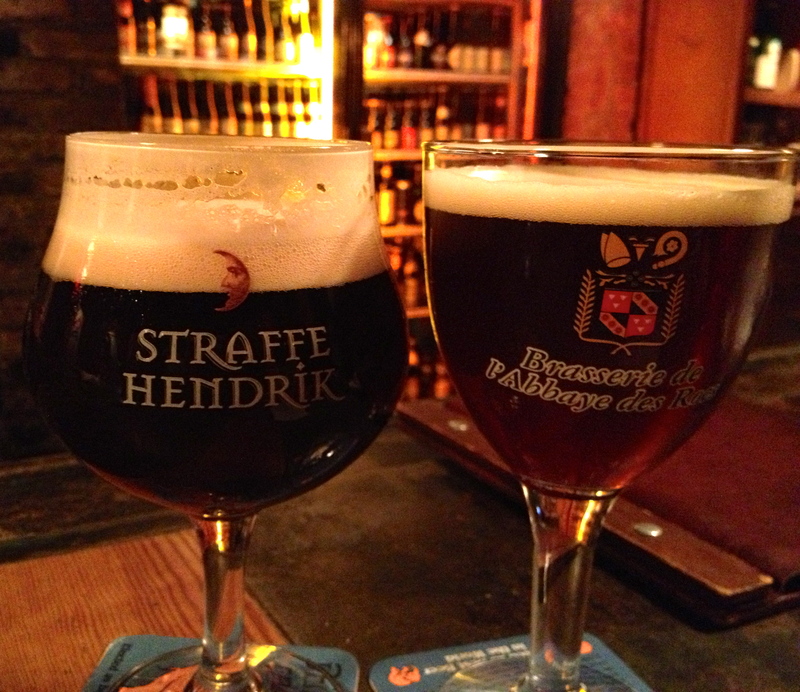 Notice how they are served in the glass from the Belgian brewery that made the beer. Most of the beer that leaves the bar area comes in the proper glass. We witness a wonderful display of bar tending from people who know their beers. Can we get food this good to go with these incredible beers? It turns out we can. 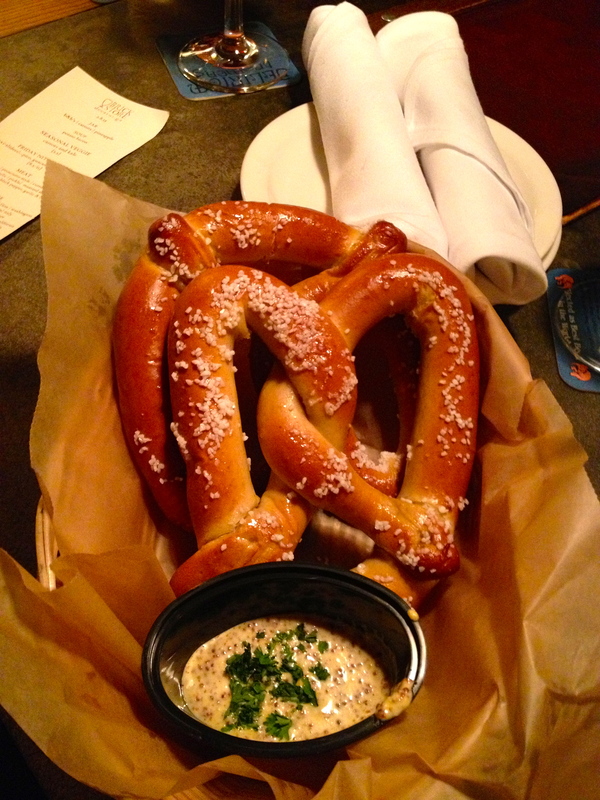 We start out with a warm, soft pretzel because that’s what you eat when drinking good beer. It comes with a mustard sauce that is great for dipping pieces of the warm, salty pretzel. Because I am hungry, we order more food than we should. The fellow sitting next to Eve is eating a chicken pot pie, and I have to have one. 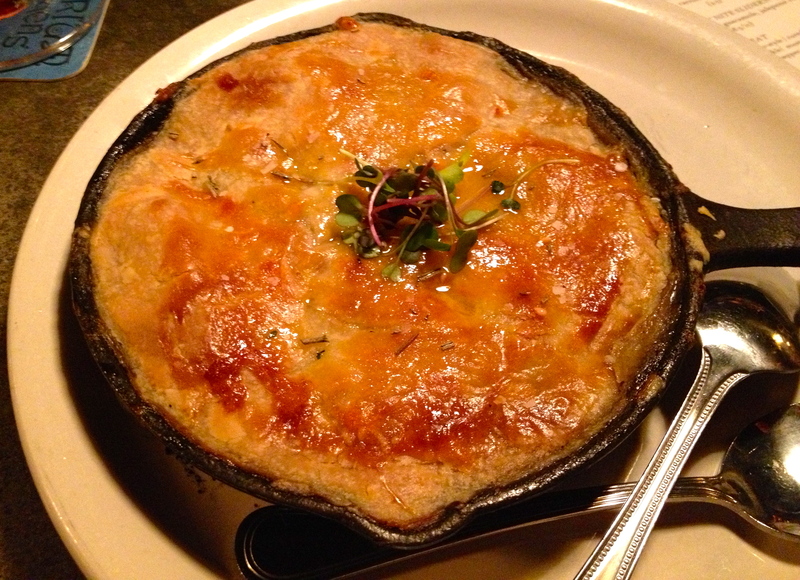 It comes in a hot iron skillet that keeps the pot pie warm the entire time we are eating it. The dish is full of chunks of chicken and the sauce is creamy and tasty. It’s a cold night, which calls for a little comfort food. Meat loaf sandwich with a healthy side of kale and carrots. Our next dish to split is the meatloaf sandwich. It’s got Tillamook cheddar cheese along with catsup and arugula under the bread. The whole thing is grilled to a golden brown color. This is a fantastic sandwich. 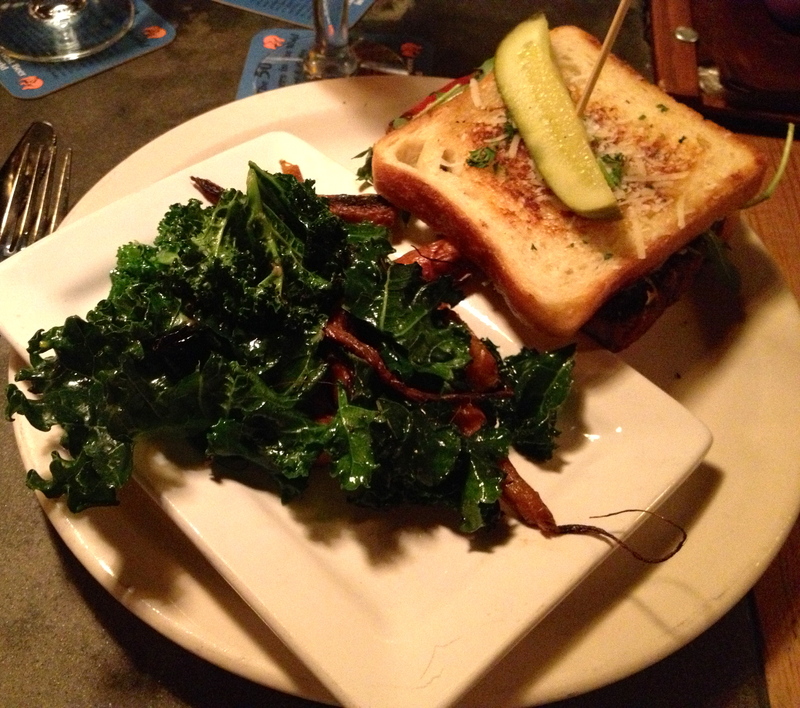 Check out our healthy side dish of kale with grilled carrots. I don’t know what they do to these carrots, but I could eat a whole bag of them. We don’t have room for dessert, but our bartender tells us how good the peanut butter whoopie pie is, and in the spirit of “fact checking” him, we order one. He’s right–it’s fantastic. 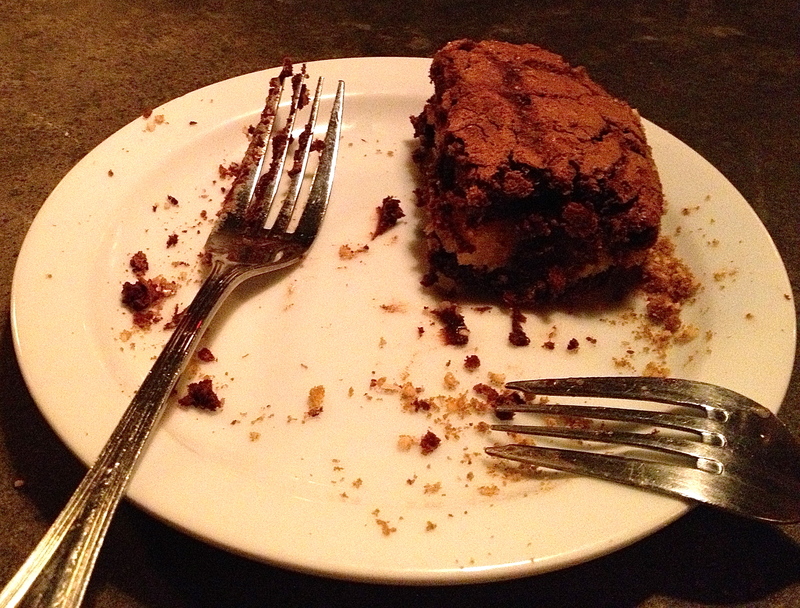 We are told that the Brick Store pastry chef is a sourpuss who makes great sweet desserts. We don’t know if she likes that description, but she does make a whoopie pie that even the Amish would like. (Another point for you if you knew that the Amish invented the whoopie pie.) 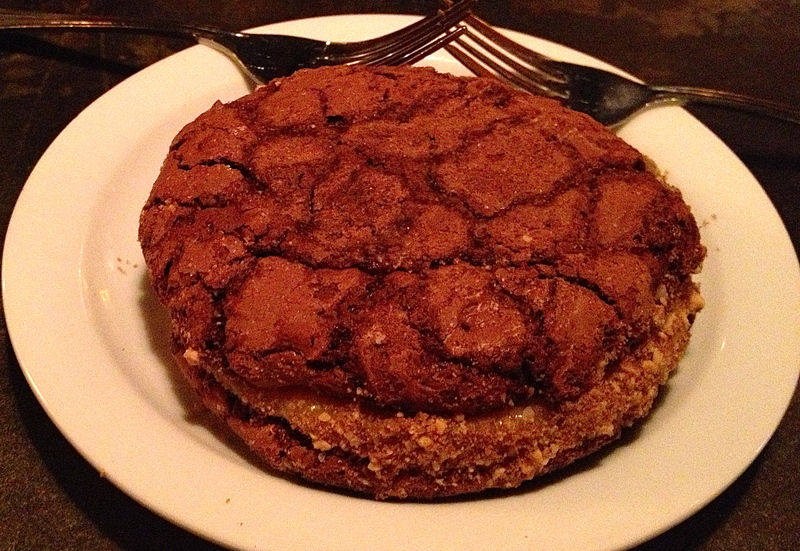 Two chocolate chunk cookies with a peanut butter filling between them make for a wonderful dessert. Here’s how far we got on the dessert. We don’t quite finish, but we do take the leftovers home for lunch the next day. We are not wasting a crumb of this! 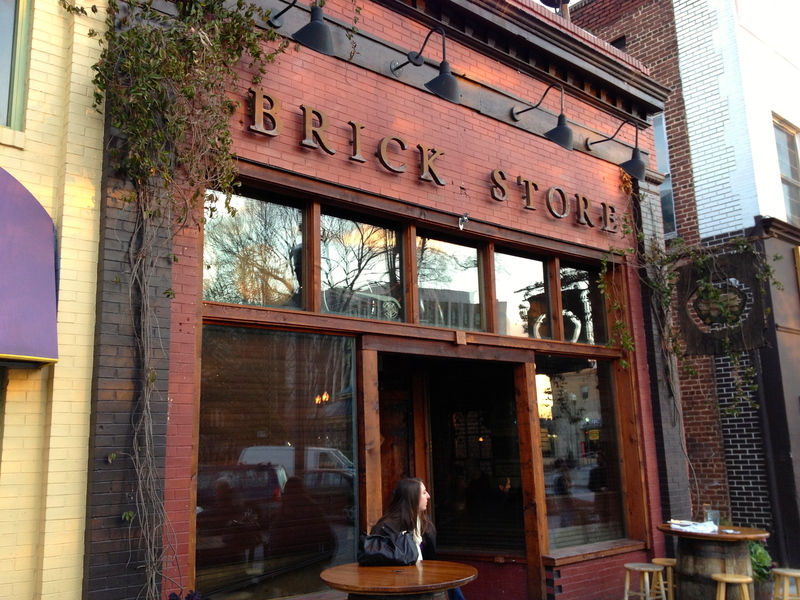 If we lived anywhere near The Brick Store, we would be here once a week, maybe more. We have some friends who recently figured out that they have spent over $30,000 here since the restaurant opened in 1997. You don’t have to spend that much, but The Brick Store is a must-visit the next time you are in Decatur.